The civil aviation industry is one of the most highly regulated industries in Indonesia. The sector is regulated primarily by Law No. 1 of 2009 on Aviation (the Aviation Law). In addition to the Aviation Law, there are a number of other implementing regulations, most of which are issued by the Ministry of Transportation. The Aviation Law stipulates that an air carrier is liable for damages resulting from the death of passengers and indemnity for the death of passengers, permanent disability or injuries caused by incidents on board an aircraft or while getting on or off the aircraft. This is further regulated under Ministry of Transportation Regulation No. 77 of 2011 on the Liability of Air Carriers (MOTR No. 77/2011), which states that an air carrier shall be liable for damages for, among other things, death, permanent disabilities or injuries (Article 2). The above-mentioned liability shall be imposed on an 'air carrier', which is clearly defined under Article 1(26) of the Aviation Law and Article 1(2) of MOTR No. 77/2011 as a 'commercial air transportation company, a non-commercial air transportation company licence holder conducting commercial air transportation operations based on the provisions of this law or any legal entity other than a commercial air transportation company entering into an agreement on commercial air transportation'. Thus, theoretically speaking, a non-commercial air carrier is not subject to such liability. The Aviation Law provides that Indonesian laws only apply to incidents occurring in the airspace above the territory of Indonesia. This is based on Article 5 of this Law, which provides that Indonesia has full and exclusive sovereignty over the airspace of Indonesia. It is also recognised in the Chicago Convention, to which Singapore, Indonesia and Australia are all contracting parties, specifically Article 1, which states that every state has complete and exclusive sovereignty over the airspace above its territory. Article 141 of the Aviation Law recognises that a carrier is liable for damages or losses suffered by a passenger, including death, permanent disability or injury. Such liability is further accorded by the Aviation Law to the air transportation company to indemnify any losses suffered by a passenger, or cargo shipper or third party. The Elucidation to this provision provides that 'consumer protection aspects' means protecting the consumers from the high fares determined by the air carriers as well as from information or advertised flight rates that are misleading or even disadvantageous, whereas 'unhealthy competition practices' means preventing air carriers from setting lower fares than other competitors in an attempt to eliminate competition from certain services or routes. The forms of air transportation companies recognised by the Aviation Law are: (1) Indonesian state-owned companies; (2) Indonesian local government-owned companies; (3) Indonesian legal entities, such as limited liability companies; and (4) Indonesian cooperative companies, whose shares are entirely or majority owned by an Indonesian legal entity or Indonesian citizens. for an air transportation company operating cargo air transportation, the newly established company should own at least one aircraft and control at least two aircraft supporting the continuation of business for the service routes. Essentially, the Aviation Law allows commercial air transportation operations, both scheduled and non-scheduled flights, to be operated by foreign entities.7 However, a foreign carrier is limited to serving only international flights for both passengers and cargo, and it should be based on a bilateral or multilateral agreement. a cargo flight operated by a foreign carrier is prohibited to carry cargo from the territory of Indonesia, unless it is permitted by the Ministry of Transportation. The Aviation Law requires every aircraft to comply with airworthiness standards, as evidenced by an airworthiness certificate issued by the Ministry of Transportation. The airworthiness certificate will only be issued to an aircraft that passes an airworthiness inspection and test. Further, the carrier is also obliged to maintain the aircraft, the aircraft engines, propellers and other components thereof to ensure continued reliability and airworthiness. The carrier should implement an aircraft maintenance programme that is approved by the Ministry of Transportation. Every aspect of aviation, including but not limited to business, operations, ground-handling service, communication, navigation and surveillance (CNS), airport infrastructure, air traffic management and supply chains, relies heavily on computer systems, which means that chances of cyberattacks are high. As a result, cybersecurity is a growing concern. Referring to Annex 17 of ICAO, Indonesia has articles regarding cybersecurity in Ministry of Transportation Regulation No. PM 80 of 2017 regarding the National Aviation Security Programme. The Regulation requires airports, airlines, AirNav Indonesia and legal entities to build a cybersecurity unit in order to prevent and mitigate cyberattacks. On 17 May 2018, the Indonesian Director General of Air Transportation received an honorary award (the Council President Certificate) from the International Civil Aviation Organization (ICAO) in Montreal, Canada. The award was a form of ICAO's acknowledgment for the achievements and developments that Indonesia obtained after resolving a number of safety oversight deficiencies and improving the ICAO effective implementation of the Standards and Recommended Practices on aviation safety. The award was also given as a result of an on-site audit in October 2017 in which Indonesia reached 80.34 per cent in effective implementation, compared to 45.33 per cent previously. The audit has also placed Indonesia in 58th place in the aviation safety rank out of 192 ICAO Member States. It previously ranked in 152nd place and was the 10th accredited country in the Asia-Pacific out of 39 Member States that are accredited by the ICAO regional office in Bangkok. In addition to receiving acknowledgment from the ICAO, Indonesia also received recognition from the European Union Air Safety Committee. On 15 June 2018, the Committee lifted the EU ban on all Indonesian airlines, which previously prohibited a number of airlines from operating within EU Member States. The ban was revoked after a positive assessment of Indonesia's flight safety by the ICAO in October 2017 and the EU aviation audit agency in March 2018, following further improvements to aviation safety in the country. The Aviation Law requires air carriers to have liability insurance in respect of passengers and cargo owners. Further, such insurance should be provided by a consortium. The minimum amount of insurance cover must be equivalent to the amount of compensation that would have to be paid to passengers and cargo owners. Under Law No. 5 of 1999 on the Prohibition of Monopolistic and Unfair Business Practices (the Indonesian Competition Law (ICL))9, there are no provisions aimed specifically at the aviation or aviation-related industries. Accordingly, all general competition regulations apply to these industries. Although the ICL features three substantive chapters – on prohibited agreements (Chapter III), prohibited conduct (Chapter IV) and abuse of dominance (Chapter V) – best practices are often not complied with.10,11 To overcome this, the Indonesian Competition Commission (KPPU) issues guidelines on how to interpret the articles of the ICL, and the approach towards and analysis of the ICL should include a consideration of best practices directed against restricted business practices and abuses of dominant position. The KPPU, as the body charged with enforcing the ICL, has thus far handed down only one decision related to the core aviation industry, namely KPPU Decision No. 25/KPPU-I/2009 on Price-Fixing of Fuel Surcharges for Domestic Flights, which was based on Article 5 of the ICL regarding price-fixing cartels (the Fuel Surcharge case). The KPPU has also investigated seven other cases concerning aviation-related industries. Although the Supreme Court ultimately overruled the KPPU's decision in Fuel Surcharge, the KPPU defined the relevant product and geographic market as scheduled air-passenger services from point of origin to point of destination in the catchment area of an airport. There are a few crucial issues to note from Fuel Surcharge, including the underlying premises for the KPPU's determination of the existence of a cartel, namely (1) the continued application of a formally cancelled agreement on fuel surcharge determination, and (2) the use of economic evidence (fuel surcharge movements, concerted action, correlation and homogeneity of variance tests, and comparison of actual to estimated fuel surcharges in the absence of a cartel). Unlike in many other jurisdictions, a cartel is not considered to be criminal matter under the ICL, and responsibility cannot be assigned to individuals (i.e., the ICL only applies to undertakings). The initiation of a criminal proceeding stemming from the application of the ICL can only take place if: an undertaking or individual obstructs an investigation conducted by the KPPU, or a defendant ignores and does not comply with a final and conclusive decision. Based on the general provisions under the Indonesian Civil Code, there is legal ground for a beneficiary to file a legal claim over an unlawful or negligent death based on the status and financial condition of the beneficiary and other pertinent circumstances.14 Further, MOTR No. 77/2011 has set a specific compensation amount of 1.25 billion rupiah per person for the death of a passenger as a result of an incident on board an aircraft or while getting on or off an aircraft.15 With the ratification of the Montreal Convention in 2016 (see Section X), persons may receive compensation for up to 2.030 billion rupiah for the death of a passenger. Based on precedent, Indonesian courts are basically accepting of claims seeking compensation for wrongful deaths. However, there is no hard-and-fast rule. In the Munir case,18 the widow of Munir, an Indonesian civil rights activist who died in a Garuda Indonesia flight from Jakarta to Amsterdam, sued Garuda Indonesia for non-material damages of 9.7 billion rupiah and for material damages of 4 billion rupiah. The material damages were calculated based on the estimated future income of Munir, the costs of education, medical care and therapy of Munir's children, Munir's own graduate student tuition and fee, and Munir's funeral costs. In the end, the court awarded Munir's widow 3.4 billion rupiah, representing the future economic loss in the form of the income that Munir could be expected to have earned by retirement age. Essentially, a carrier is subject to strict liability under the Aviation Law. However, the liability of a carrier is limited to the amounts stipulated in MOTR No. 77/2011 (see Section VII.iii). bring legal action: under Article 176 of the Aviation Law, the heirs of deceased passengers who suffer losses may bring legal action against the air carrier in the civil courts using Indonesian law as the governing law. Such actions may only be brought by the heirs of deceased passengers based on the following evidence: (1) documents evidencing inheritance rights; and (2) an official statement from the authorities setting out losses owing to aircraft operations (Article 21, Paragraph 1 of MOTR No. 77/2011). However, the law imposes a time bar for bringing such actions. Article 177 of the Aviation Law provides that the maximum time limit for the initiation of such an action shall be two years counting from the date on which the baggage is supposed to have arrived at the destination. Consequently, the time limit for filing a claim under Article 177 of the Aviation Law would appear at first sight to apply only to a passenger or cargo owner whose property is lost or damaged. However, this is greatly expanded by the Elucidation on Article 177, which states that losses suffered by a passenger or cargo owner are not confined to their baggage, but also include losses in the form of death or injury. The Aviation Law is silent on the liability of the manufacturer or owner of an aircraft towards passengers, as the Law only recognises the liability of a carrier towards its passengers. Nevertheless, that does not guarantee that the manufacturer or the owner will be released from aviation claims. Indonesian law enables anyone to file a tort claim in the court for an unlawful act committed by another party. existence of causal relationship between the act and the loss. The claimant will need to establish to the court that all of the above elements have been fulfilled. The amount of compensation that should be paid by an air carrier operating domestic carriage in the event of loss is governed by MOTR No. 77/2011, and is outlined below. the compensation for loss, damage or delay of cargo shipments is 19 SDR, or approximately 341,000 rupiah per kilogram. There are two types of reports: a mandatory occurrence report, and a voluntary occurrence report/information.20 The mandatory occurrence report applies to the operator, whether Indonesian or foreign, which shall immediately, with minimum delay and by the most suitable and quickest means available, report to the National Transportation Safety Committee (NTSC) and the Directorate General of Civil Aviation (DGCA) when an accident or serious incident involving an aircraft occurs. Meanwhile, the voluntary occurrence report/information is open for submission by any person who has knowledge of any hazard that may be a precursor to an accident or serious incident; such voluntary report should go to the NTSC and DGCA, or the nearest transportation authority office, or any government office as soon as is reasonably practicable. For the implementation of the aforesaid provision, the DGCA established the State Safety Programme (SSP) to identify obstacles in the aviation system that need to be handled.21 The voluntary report can be submitted online through the SSP official website (www.ssp.hubud.go.id) by completing a form with details of the incident. The reporter's identity will be treated as confidential and may only be used if the DGCA considers it necessary to contact the reporter for further information in the interest of conducting a safety analysis. The DGCA may also conduct an investigation whether the reporter may have contributed to an incident. In the event the reporter has in any way contributed to the incident, the voluntary reporting may become a discretionary consideration in easing any administrative sanctions by the DGCA. Since the enactment of the Aviation Law, there have been a number of major cases concerning the aviation sector in Indonesia, most of which have been in relation to the liability of the carrier. These cases contribute to further development of Indonesian aviation law. First, in May 2012, there was an aircraft accident involving a foreign aircraft that was operated by the aircraft manufacturer. The accident, which killed all passengers, happened during a demonstration flight. From a regulatory viewpoint, it could be interpreted that the operator of the aircraft (the aircraft manufacturer itself) was not an air carrier or an air transportation company, thus rendering the Aviation Law inapplicable. Another interesting case involved an action brought by a passenger against an Indonesian carrier for the loss of baggage during a domestic flight in November 2011. Despite the fact that the amount of compensation for loss of baggage is set out in the Aviation Law and in MOTR No. 77/2011, the Supreme Court ruled in October 2014 that it would be unjust if the actual amount of loss suffered by the plaintiff was higher than the amount of compensation stipulated by the legislation. Consequently, the Court held that the plaintiff should receive more compensation than the statutory amount. An additional development after the adoption of the Aviation law was the ratification of the Convention for the Unification of Certain Rules on International Air Transport (the Montreal Convention). The Montreal Convention was implemented into Indonesian national law through Presidential Regulation No. 95 of 2016 dated 21 November 2016 on Ratification of Unification Convention of Certain Rules on International Air Transport. The Presidential Regulation came into force on 23 November 2016. This is regarded as the most significant recent change to aviation law as it ensures that Indonesia applies international standards for liability of air carriers and provides legal certainty for passengers, goods, baggage and cargo of international flights, as well as protection for airlines in the form of limits to their liability for compensation. No new laws or regulations related to aviation were enacted in 2017. Nevertheless, the recognition of Indonesian aviation safety from the international community has reflected Indonesia's continuous commitment to comply with international aviation standards. Given that the number of disputes related to the liability of carriers has been growing in recent years, the Ministry of Transportation is currently considering the possibility of permitting dispute resolution through alternative dispute resolution mechanisms, such as mediation and arbitration. 1 Eri Hertiawan is a senior partner at Assegaf Hamzah & Partners. 2 Ministry of Transportation Regulation No. PM 12 of 2015 on Online Licences of Air Transportation. 3 Application for air transport licences can be made via http://aol.dephub.go.id. 4 Ministry of Transportation Regulation No. 51 of 2014 on Mechanism of Calculation Formulation and Determination of Upper Limit on Fares of Economy Class Passengers of Domestic Scheduled Air Carriers, as amended by Ministry of Transportation Regulation No. 59 of 2014 and by Ministry of Transportation Regulation No. 91 of 2014. 5 Article 106(3) of the Aviation Law. 6 Article 118(2) of the Aviation Law and Article 2 of the Ministry of Transportation Regulation No. 97 of 2015 on Technical Guidance on the Ownership and Control of Aircraft. 7 Article 83(3) and 86 of the Aviation Law. 8 Passengers who have disembarked a previous flight. 9 Currently the ICL is being amended though there is still no particular date on the effectiveness of the amendment. 10 Chapter III on prohibited agreements stipulates the restriction on oligopoly, price-fixing, price discrimination, below-market pricing, minimum resale price maintenance, market or territorial allocation, (group) boycott, cartel, trust, oligopsony, vertical integration, exclusive dealing, agreement with foreign party. Chapter IV on prohibited conduct stipulates the restriction on monopoly, monopsony, market control, predatory pricing, unfair pricing, bid-rigging, misappropriation of trade or company secrets, group boycott through conspiracy, abuse of dominant position, interlocking directorate, cross-ownership and merger and acquisition. (3) Article 51: monopoly by a state-owned company mandated by law and concerning the well-being of society at large. 12 Indonesia entered into the open skies agreement in January 2015 following the Aceh tsunami so that social and humanitarian assistance could be more efficiently directed. The ASEAN Open Skies Policy was implemented in 2015. 13 Law No. 1 of 2009 regarding Aviation, Regulation of the Ministry of Transportation No. KM 25 of 2008 on Air Transportation. 14 Article 1370 of the Indonesian Civil Code. 15 Article 3 of the Ministry of Transportation Regulation No. 77 of 2011 on the Liability of Air Carriers. 16 Article 166 of the Aviation Law. 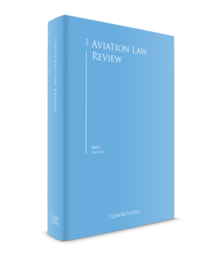 17 Elucidation of Article 180 of the Aviation Law. 18 Supreme Court Decision No. 2586 K/PDT/2008 dated 28 January 2010. 19 Amount after the Inflation Adjustments to Liability Limits Governed by the Montreal Convention, effective 30 December 2009. 20 Ministry of Transportation Regulation No. 14 of 2015 on the Civil Aviation Safety Regulation Part 830 on the Notification and Reporting of Aircraft Accidents or Serious Incidents and Accident or Serious Incident Investigation Procedures. 21 Ministry of Transportation Decree No. 8 of 2010 on the State Aviation Safety Programme.